We are a small group of supporters and we found a new football club, Sports Club “SUPPORTER 2.0” in Cluj-Napoca, Romania. We propose the cooperation of all supporters, by offering a brand new experience as a football fan, to be the MANAGER of a real football club, by using the www.realclubmanager.com web app! The supporters will have the opportunity to participate in making the most important decisions within the club. The first one will be the choosing of the HEAD COACH. For every contribution of just 40 romanian lei, less than 9 € (40 RON = 8,58 €, 02.07.2018), you will get one voting right during one month period! The first contribution will be at least 120 lei (120 RON = 25,74 €, 02.07.2018) and you will get one voting right valid for 3 months. There are also the options of 220 lei (-20 lei OFF) for one voting right valid for 6 months and 400 lei (-80 lei OFF) for one voting right valid for 1 year. The users can buy an unlimited number of voting rights. After the first contribution, the user will have the option to extend the existing voting rights by 30 days, after paying 40 lei to the club. The extension will be done only to the active voting rights held, starting with those that expire first. New voting rights can not be acquired by using the extension option. The voting rights can be used for each app function during their validity period. MANAGERS can vote online certain major decisions in the club, like Choosing the HEAD COACH and Choosing a substitution during one game by using the active voting rights. The next polls will be selected from the users proposals. The board will have to do everything needed to apply the supporters’ wish. MANAGERS will be able to make one proposal per week for the next decision to be voted and to support all other managers proposals by using the voting rights. The board, technical staff and the captain will respond weekly to the first 10 most supported decision proposals. MANAGERS will be able to make a tactical proposal per week and to support the other managers tactical proposals. The HEAD COACH will respond weekly to the first 10 most supported tactical proposals. MANAGERS can propose one player per week to be acquired and be able to support the other managers proposals. This will create a scouting department within the team, and the Sports Director (or the board) will respond weekly to the first 10 most supported proposals. MANAGERS will be able to watch LIVE the matches, trainings and other events within the club and will be able to give LIVE instructions to the HEAD COACH. The coach will be informed in real time only if one proposal will reach a level of support of at least 20% from all active votes. He will spontaneously decide to implement the managers' proposal or not. At the request of the coach, some tactical trainings will be unavailable. The coach can check the LIVE proposals whenever he wants and can apply the managers’ ideas. Basically, the coach will have a permanent assistant in all managers’ voice, and among them may be even more experienced coaches, which can be “realclubmanagers”, because they are also football fans. MANAGERS can propose the starting line-up and few tactics options before each match, by using your active voting rights. The HEAD COACH will choose the formation (eg 4-4-2, 4-3-3) before the match and the managers will choose one player for each position. The MANAGERS will be able to make this proposal no later than 3 hours before the start of a match. The results of each player for each position will be displayed, and the players with the most votes for a position will be displayed in the formation. In the case of managers holding more voting rights, the players selected will receive the number of votes used by the manager. The board and staff will have the final decision for applying the most supported proposals, but they will have the obligation to respond and argue in case of differences of opinion. This way we create an efficient communication system between the MANAGERS and the employees of the club. In case of the starting line-up, the HEAD COACH will choose the first 11, after considering the MANAGERS vote, but after the game he will respond to differences of opinion between himself and the managers. (For example, I played with Florin on the left, because Andrei is cold.) In a classic organization, the coach should respond to an avalanche of contradictory opinions and accusations. (which is impposible) Using www.realclubmanager.com, he will answer only to one opinion, generated by all managers' choice. MANAGERS will be able to evaluate the players after each match by according ratings (1-10). This way we’ll create an efficient incontestable performance evaluation system. The TOP 10 MANAGERS, having the most active votes at the end of each month, will be invited to attend weekly (if SUPPORTER 2.0 will be a proffesional club) or monthly (amateurs) private meetings with staff and players. We will listen to their advices, vision and strategy in order to develop SUPPORTER 2.0. For those MANAGERS who are not able to participate, a videoconference will be organized. This way we will offer to our MANAGERS all the benefits that a football club owner can have. In very rare cases football club owners can earn money. In the future, we would like to offer to our MANAGERS the possibility to buy percentages of the players value in order to get the same percentage of the selling value. This function, offered by a football club is against the rules, but we will try to get a derogation or to outsource this function in the future. What’s happend now at a football club? The TOP 1 to 5 financial contributors are the only ones who make the most important decisions. Because of the lack of transparency, the football passion which creates lots of contradictory opinions and the impossibility to collect them in an organised way, the rich people who owned and control the football clubs won’t allow the supporters to be involved in decision-making system. It’s a GAME offered exclusively to the very rich people! www.realclubmanager.com web app propose to solve this issue and to involve all supporters into the decision-making system of a football club! www.realclubmanager.com will TRANSFORM ALL SUPPORTERS OPINIONS INTO A SINGLE ASSUMED AND INCONTESTABLE VOICE, which the club employees can easily interact with! This voice should be ASSUMED because it will be the opinion of all MANAGERS. Every MANAGER should understand that his opinion must be agreed first of all by the other supporters to be relevant for the club and to be considered a good idea for the development of the club. Else this opinion will remain a personal idea which is not agreed by many supporters. Unlike the traditionally management, every single fan opinion will be exposed and considered by all MANAGERS and www.realclubmanager.com has the role to select the most supported ones to be presented to the board and staff as an assumed voice. The voice will be INCONTESTABLE because every MANAGER has the option to get a higher decision power in any moment, by offering a greater financial support to the club. The other supporters projects are started from the rivalry between supporters and the rich persons and entities who owns and control the football clubs and against the last ones, because it’s very hard to understand their hobby to invest lots of money in a football club and this way everytime will be created suspisions, accusations and teories about their activity and decisions. That’s why the other supporters projects limit the users to pay a certain amount to get only one decision right. We think that’s the main reason of their failure. Even to the most democratic clubs in the world, the president function is brought with a huge financial contribution to the club, of course by very rich people. We think that the rich people are indispensable for the football clubs and for sure they shouldn’t be excluded from any football project. We think it’s fair enough, that a supporter who made a contribution of 1.000 $ to a club to have more decision power than a supporter who made a 10 $ contribution. Else would be unfair. 3) The restriction for MANAGERS to make more than 1 decision/tactics/player proposals per week and 1 LIVE proposal per day will be aplied to every manager, doesn’t matter how many vote rights he owns, because a good idea can come from any supporter, doesn’t matter of his financial power. We will also offer voting rights to the sponsors, proportionally with their financial contribution. Initially we will give to the sponsors 1 voting right valid 1 year, for every sponsorship of 400 lei, like to the other MANAGERS, because in this moment we see their sponsorship more as a social responsability than promotion. For every 5.000 active MANAGERS reached, we will increase the vote “price” for the sponsors with the price of one vote. For example: If we will be 50.000 active MANAGERS, we will offer 1 voting right valid 1 year, for every 4.000 lei. For the sports betting operators we won’t offer voting rights, in order to avoid any accusation and suspicions. At the moment we offer in the web app banner places for 400 lei/month. We can also offer links or messages in the promoted posts on social network. This project is not a contest between supporters, it’s a fans cooperation to develop a football club. We consider the rich football clubs owners and sponsors football supporters too and www.realclubmanager.com propose THE UNION OF ALL SUPPORTERS IN ORDER TO DEVELOP SUPPORTER 2.0 FOOTBALL CLUB! We know that Romanian football has a weaker level, but the good thing is that with a yearly budget of about 25.000 euro, we can start from the 4th tier league, as amateurs and if we will be 50.000 MANAGERS, paying monthly 9 euro we can fight for the first tier champions title, which gives us the perspective of playing in the european cups in few years. Everything depends on us and our decisions! Be part of it! BECOME A SUPPORTER 2.0! 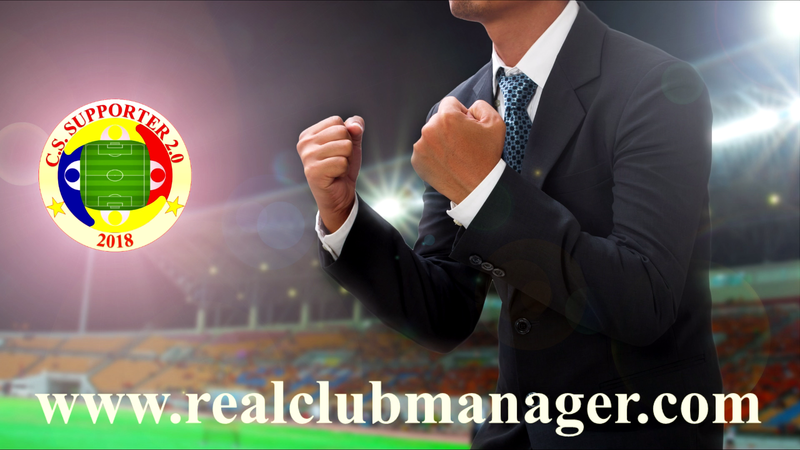 BE A REALCLUBMANAGER!